Back in 2012, during THE SUMMER OF PEACE, in Media, I was gifted a large limb of The Grandfather Tree at Pendle Hill. The Tree, a massive Beech, and the land it sits on had been gifted to Pendle Hill from Carl Big Heart’s family, when he was just a boy. The Tree is considered one of the oldest in the area, it is over 300 years old. 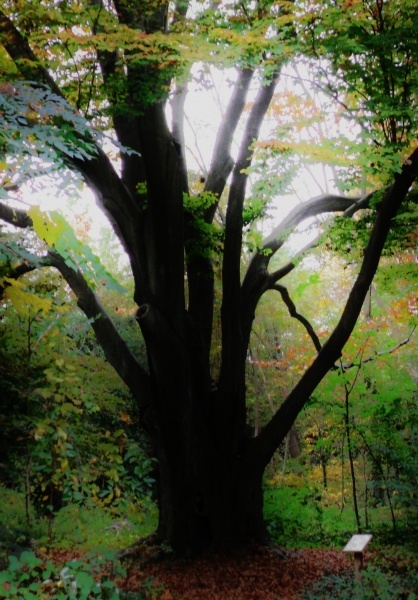 Many know of the Tree and, like myself, visit it when the need arises for a better awareness. When one feels the need for wisdom and courage, understanding or inspiration. I visited the Tree often during the Summer of Peace events. The Summer of Peace was the offspring of the Peace Ambassador Training that I had taken.We were encouraged to use the training within our communities…to share what we learned. I was excited to share it despite the fact that I had never done any community organizing..at all. I jumped in with very little help and planned not only a Peace Day event…I planned a summers long event. The information was just that compelling! When I saw, one day on my visit to the Tree, that large portions had been cut from it, all I could see was the opportunity to create a peace pole. I envisioned that someday that pole would have a home in our community of Media, PA and it would hold with in it the prayers, wishes and hope for peace. So I asked for a limb I had chosen with this intention and it was kindly and generously gifted. It has graced our yard for over two years. I have communed with it and waited for the time when it would begin to meet up with its intended purpose. And it seems now is the time . My husband Nick and I have taken a woodworking class to learn how to make it ready in a gentle way. Nick has done the lions share of the work, lovingly following my vision. Deep channels have been carved into the pole. There are 5 channels and when finished there will be 7. It is hoped that these channels will be filled with the peaceful intentions of those in our community and sealed with a clear epoxy, so that these wishes will be visible. Someday I hope for this Peace Pole to stand in our home town, holding within itself the powerful vibration for the many layers of peace. During Happiness Week the pole will make its first appearance. I have joined with the Beam Your Dream event on Fri. April 25 from 5 to 8pm, and again on Sat. at 2 to 4pm. This seemed a good way for the pole to make its debut. I will have colored paper to write your intention for peace. I will also have small shells and stones that can be added with an intention for peace. your intention can be for personal peace, peace in your relationships, community peace and or world peace. We must start somewhere. Your intentions will be placed in the channels and when full they will be sealed. This event will mark for me the first of any events for The International Day of Peace, which will fall on Sunday, Sept. 21, 2014. Hope we can get plenty of participation. Peace and happiness are worth pursuing and certainly worth working for. We must as ordinary people do extraordinary things in this pursuit. It really is up to us to create the conditions and culture for peace…. to be cultivators of peace, making war, someday, obsolete.